We wait all year for summer. School closes and pools open. The days get longer and bedtimes get loose. We dive into camps and vacations and create epic bucket lists, cramming in all that we can and saying yes to just about everything. But even when it’s 90 degrees and there’s a small pool of sweat somewhere in your bra, it can be hard to say yes to shorts, the thought of wiggling into them a cloud over the whole season. Pam, a rock-star stylist in our St. Louis Park store, has always avoided shorts, not loving how they fit her athletic legs and emphasize her pear shape—a feeling that heightened after having two kids. But the caramel macchiato connoisseur (venti iced skinny with almond milk and three pumps sugar free vanilla, thankyouverymuch) is ready to soak up every hot day ahead with a few of our favorite no-shorts-required looks—and zero holding back. We wear pencil skirts to work and flowing skirts for special occasions, so it’s easy to forget that not all skirts are dressy. 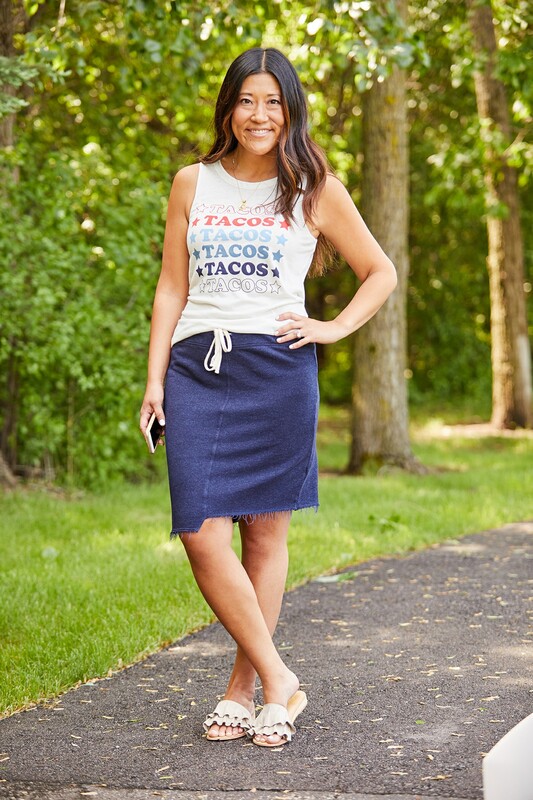 But a casual knit or stretchy denim skirt is the perfect low-key option for everything from weekend errands to backyard grilling with your neighborhood crew. Our Sundry Solis Skirt skims your hips, comfortably highlighting your curves while you play lawn games or prep the table. The drawstring gives you the perfect fit, while the asymmetrical hemline with light destruction gives the look a little bit of edge that we love. Dresses are one of the easiest options for casual summer days—a one-and-done look that seamlessly takes you from day to night. Made from soft terry that feels like your favorite sweats, our Sanctuary Bryce Lace Up Dress is super comfortable and lightweight enough for a long day in the sun. The braiding detail elongates your shape, short sleeves provide some arm coverage and it looks effortless with a hat and sneakers for those marathon weekends at the baseball field. When it’s time to host the post-game team dinner, just switch into slides and add a jacket. A lightweight pair of cropped pants is the way to go if you’re running errands or have an extra-active day planned—they’ll keep you covered while sitting pretzel-legged at picnics and comfortable cruising around the zoo all day (no chafing!). Our Sanctuary Camo Terrain Crops are made from lightweight cotton we specifically sourced for sizzling days, and they stretch with you to eliminate pinching through the waist and thighs as you circle back to the chimpanzee exhibit for the sixth time. 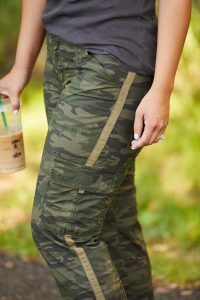 The cropped length is an easy fit for any height—so you don’t need to worry about hemming—and the camo print adds instant cool factor. Do you steer clear of shorts? What’s your go-to look for hot summer days? Let us know in the comments below! Pam looks great in all the different styles. Great to see a model who looks like a regular woman. I thought I was the only one who doesn’t like wearing shorts. Great post! Leanne—you’re definitely not alone! Luckily, there are so many great alternatives! I’m so glad you enjoyed the post. I also avoid shorts as much as possible. My favorites this spring have been my camo Sanctuary crops and Kut denim skirt. I’m also loving the fact that I can cut/crop my older jeans to create a cropped distressed raw edge. It makes being a petite fun again! Such a great idea about cutting your older jeans, Kathleen! I also love cropped jeans as a shorts alternative—they’re basically the only denim style I wear! Love this!!! I also am not a short fan for the same reasons. My favorite go to is the sundry ruched skirt. And the Allison joy tank dress. THanks for the great post!!! Love all of your outfits! Skirts are such an easy and fun alternative to shorts when it’s hot! We’re so glad you’ve found the Sundry Soleil Skirt—so flattering—and enjoyed the post! Love the great non-short outfit ideas and I especially love that you use real, beautiful women to model the ideas. My go to outfit for the summer is the Michael Stars Tank MIDI Dress. I have them in two colors and I love them! They look great alone or even as a stylish beach cover up! Also I love all my jumpsuits!! I love dresses like the Michael Stars midi that pull double-duty—such a great idea to also wear yours as a cover-up! Love this article! You are sharing the great info. Thanks for sharing.